We take a unique approach in combining experimental and observational astrophysics - we focus on important astrophysical questions, and then build the best instruments to answer them! Our main science themes center on the formation and evolution of galaxies at redshifts between 1 and 3, and the physics of galactic nuclei and black holes across cosmic time. Key results have been the unambiguous detection of the supermassive black hole in the center of our Galaxy through stellar orbits and the first successful test of General Relativity in the vicinity of a supermassive black hole, the first substantial survey of high redshift galaxy dynamics using integral field spectroscopy, and the first studies of cold gas and far-infrared luminosities of distant massive 'normal' galaxies. These results show samples of our research on the physics and growth of black holes in galactic nuclei, especially the Galactic Center; gas dynamics in the vicinity of SMBHs; the nature and evolution of star forming galaxies at low and high redshift; and feedback processes from star formation and AGN. Within our own Galaxy, our research focusses on the physical and chemical evolution of dense gas associated with protostars and protoplanetary disks, with special emphasis on the role of water. A key strength is that we lead world-class instrumentation developments that are driven by our astrophysical research. In the near-infrared, we have been the PIs for led or significantly contributed to several current instruments at the ESO VLT over the last 2 decades: SINFONI, the integral field imaging spectrometer, NACO, the diffraction limited imager, and the KMOS multi-IFU spectrograph. For the Large Binocular Telescope (LBT) we developed the MOS unit for the LUCI imager/spectrometer and the ARGOS wide field laser AO system. We were the PI Institute for the far-infrared camera/spectrometer PACS operating from 2009 to 2013 on board ESA's Herschel Space Observatory. Currently, we are the PI-group for GRAVITY, an astrometric imager and the first second-generation instrument for the VLT interferometer. GRAVITY is now in full operation, and is a game changer for infrared interferometry, because it can routinely observe sources down to 18th mag (PLEASE CORRECT), nearly 10 magnitudes fainter than previous interferometric instruments. Spectacular results from our team include testing General Relativity near the Galactic Center black hole, and kinematically resolving the broad line region in the nearby QSO 3C273, among other topics. We are also the PI institute for the ERIS diffraction limited imager and spectrograph for the VLT (with commissioning in 2020), and the first-light instrument, MICADO, for the upcoming European Extremely Large Telescope. At longer wavelengths members of our group have actively supported the upgrade of NOEMA at IRAM. For more details visit the homepage MPE Infrared-Astronomy. High resolution studies of galaxy evolution like the surprising detection of a massive rotating disk in the z=2.38 galaxy BzK-15504 are made possible by our active instrumentation program, for example the PARSEC laser at the ESO VLT. High Energy Astrophysics addresses among the most extreme processes and regions in the Universe. Plasma with temperatures up to billions of degrees, and the interaction of highly energetic electrons with magnetic and photon fields generates high energy radiation in the X-rays and gamma rays. Studying cosmic objects in these wavebands gives insights into physical processes that often cannot be achieved when observing in other wave bands. The High Energy Astrophysics group at MPE, comprising about 80 members, has its major scientific emphasis on the study of these processes, mostly via X-ray observations, but also extending to other wavebands. Our main astrophysical themes are: 1) Investigating physical processes including strong gravity around black holes and other compact objects; 2.) The cosmic history of black hole growth and its relationship to galaxy evolution; 3) Large scale structure, as probed hot gas in clusters and groups of galaxies, and the related cosmological implications; 4) gamma-ray bursts. To achieve our scientific aims the group runs a major experimental program in the development and construction of X-ray instrumentation. We also develop highly specialized X-ray detectors, which including the EPIC pn-CCD camera on XMM-Newton and the eROSITA pn-CCD cameras. We are currently developing the technologies for the Athena Wide Field Imager (WFI) instrument. eROSITA instrument for the Russian Spectrum-RG satellite. After its launch in 2016, eROSITA will perform a new X-ray all-sky survey a factor of 10-30 deeper than ROSAT and HEAO-1. Using optical, infrared and radio data to better interpret the X-ray results has also stimulated working in a worldwide net of astronomy collaborations. Left: eROSITA instrument during the qualification tests. Right: Planned eROSITA “cadence” map. The celestial sphere in equatorial coordinates is color-coded by the number of visits of eROSITA during the 4-years all-sky survey. The eROSITA all-sky survey is expected to provide insight on 3 million AGN and 100000 clusters. The USM-MPE extragalactic research group is a joint effort of the University Observatory of Munich (USM) and the Max Planck Institute for Extraterrestical Physics. The group is located both at the USM (see 'Extragalactic Astronomy') and at MPE. Senior group members are Prof. Ralf Bender, Dr. Maximilian Fabricius, Prof. O. Gerhard, Dr. Ulrich Hopp, P.D. Dr. Roberto P. Saglia, Dr. Ariel G. Sánchez, Dr. Stella Seitz and Dr. Jens Thomas. We pursue these science questions with a combination of optical and near-infrared observations, theory, numerical modelling, and data interpretation. We carry out studies of black holes in local galaxies without active galactic nuclei, measuring their masses through stellar dynamics. Using similar techniques we reconstruct the stellar orbital distributions and dark matter halos of dwarf and giant early-type galaxies or globular clusters. Exploiting the multiplexing capabilities of our KMOS spectrograph, we study galaxy evolution up to redshift 2.5 by observing large samples of star forming and passive galaxies. ( eBOSS) and Dark Energy Survey ( DES), and future surveys such as the Hobby-Eberly Telescope Dark Energy Experiment ( HETDEX) and the ESA space mission Euclid. Galaxy clustering and gravitational lensing measurements based on these data sets probe the large-scale structure of the universe with unprecedented precision, providing invaluable information on the nature of dark matter and dark energy, the growth of structure, neutrino masses and inflationary physics. The design, construction, analysis, modelling and interpretation of these data sets are some of the main activities of our group. The numerical modelling required for our projects is based on state-of-the-art algorithms run on supercomputers. Some of these methods are developed or implemented within our group. Recent examples are Schwarzschild's orbit superposition method used for measuring black hole masses, and the NMAGIC adaptive N-body code for modelling galaxy dynamics. For more details visit our homepages OPINAS or PhD-Thesis Projects. 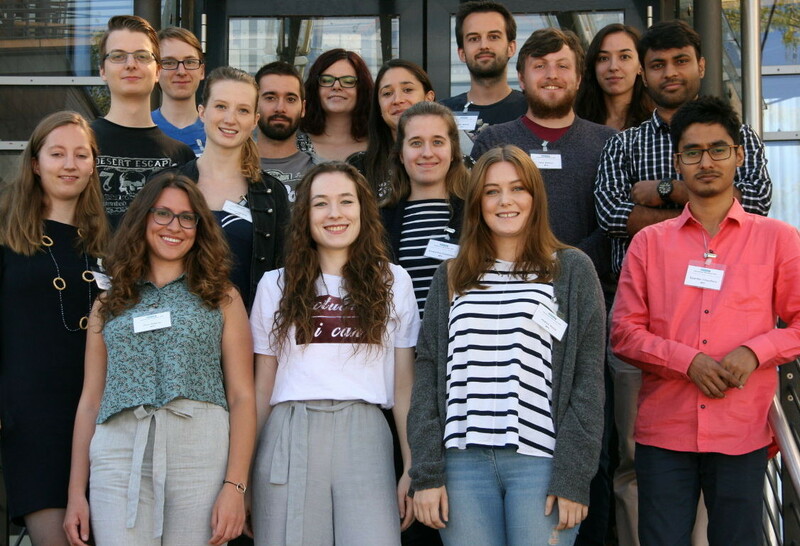 We are an interactive group of observers, theoreticians and laboratory experimental researchers, with strong links to other national and international Institutes. Our aim is to study interstellar clouds and their physical/chemical evolution toward the formation of stars and planetary systems. On the one hand, molecular lines are used as tools to unveil the physical structure and dynamics of clouds and star/planet forming regions. 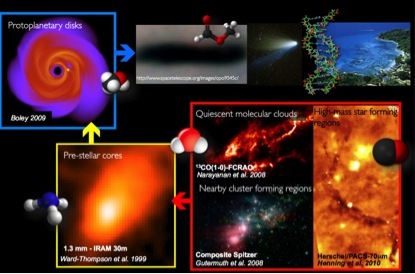 On the other hand, observational and theoretical studies of molecules during cloud evolution allow us to investigate the increase in chemical complexity from the initial diffuse stages, to the dense cloud cores within which stellar systems form, to the circumstellar disks where planets are assembled, with the final aim of shedding light on our cosmic origins (cf. the Figure at the end of this section). We observe molecular lines with state-of-the-art telescopes (such as ALMA and the IRAM Plateau de Bure Interferometer / NOEMA) and we make predictions using comprehensive chemical models inclusive of surface chemistry (i.e. the chemistry occurring on the surface of dust grain particles), as well as magneto- and hydrodynamic codes coupled with simple chemistry. We started our activities in April 2014 and we are now building a high-precision molecular spectroscopy laboratory, where astrophysical important molecular ions, radicals and organic molecules will soon be studied. Laboratory experiments will provide a fundamental input to our observational and theoretical activities, as transition frequencies will be measured with high precision and the molecular structure determined. We also plan to use our experiments to refine calculations of collisional coefficients needed in radiative transfer codes, which test theories by simulating observations of dynamical-chemical model results. Observations: (1) From filaments to dense cores: kinematics and the importance of magnetic fields. (2) From dense cores to protoplanetary disks: physics and chemistry in the inner 1000 AU. Theory: (1) The effects of chemistry in magneto-hydrodynamic models of dense cloud cores. (2) The time scale for star formation by using comprehensive chemical models coupled with hydrodynamic simulations of molecular clouds. Laboratory: (1) Chirped pulsed experiment: setup and first light on complex organic molecules. (2) High precision molecular spectroscopy of molecular ions and radicals of astrophysical interest. Our cosmic origins: Schematic illustration of the various phases in the process of star and planet formation, which are studied in the CAS group (from parsec-scale molecular clouds in the bottom right, to the 10,000 AU-scale of pre-stellar cores, to the 100 AU-scale of protoplanetary disks in various stages of evolution, to our Solar System). The five superposed molecules (anticlockwise from the bottom right: CO, H2O, NH3, CH3OH, HCOOCH3) are among the most common molecules observed in star forming regions. They are only five out of the about 180 (mostly organic) molecules detected in space. Interstellar molecules are the building blocks of more complex organics also found in meteorites, such as amino acids, purine and pyrimidine bases and sugars, i.e. the basic building blocks of proteins and nucleic acids (such as the deoxyribonucleic acid, DNA, in the top right) present in living beings on Earth (see Caselli & Ceccarelli 2012; Ceccarelli et al. 2014 for more details). The research of the computational astrophysics group at the USM is focussed on dynamical processes in galaxies, related to galaxy formation and evolution, the evolution of the interstellar medium and star and planet formation. Using different numerical methods and codes, coupled with special hardware connected to local PC clusters for fast computations we explore the complex non-linear evolution of gas in galaxies and its condensation into dense molecular clouds and stars. We explore the collapse of protostellar clumps and cores, the formation of protostellar disks and their condensation into planets. On larger scales we investigate galaxy-galaxy interactions including dark matter, stars and gas and study the morphological transitions of galaxies and the origin of their spheroidal components. For more details visit the homepage USM Computational Astrophysics. Hot Stars cover sub-groups of objects in different parts of the HR diagram and at different evolutionary stages. The most important sub-groups are massive O/B Stars, Central Stars of Planetary Nebulae, and Supernovae. All these objects have in common that they are characterized by high radiation energy densities and expanding atmospheres. Due to these properties, the state of the outermost parts of these objects is characterized by non-equilibrium thermodynamics and radiation hydrodynamics. The USM Hot Star group is experienced in the corresponding theory of stellar atmospheres, and in model simulations and the computation of realistic synthetic spectra for these astrophysically important objects. The present cosmological question of the reionization of the universe requires quantitative predictions about the influence of very massive, extremely metal-poor Population III stars on their galactic and intergalactic environment. The objective is to deduce the ionization efficiency of a Top-heavy IMF via realistic spectral energy distributions of these very massive stars. The main focus of the working group thus is to develop diagnostic techniques in order to extract the complete physical stellar information from the spectra at all wavelength ranges. For more details visit our homepage USM Stellar Astrophysics - Expanding Atmospheres of Hot Stars. We explore topics from the formation of single stars and planetary systems to larger scale star and cluster formation by means of numerical and theoretical investigations. We use state-of-the-art numerical tools and develop new algorithm in-house in order to tackle the problem of radiation transport in complex evolving hydrodynamical systems. PhD projects can be offered in the context of these research topics listed above. Bubbles and pillars sculpted by HII regions in a turbulent molecular cloud. Snapshot of the neutral gas from a Smooth Particle Hydrodynamic simulation performed by Jim Dale. The Plasma-Physic group at the USM is involved in the research of the macroscopic dynamics of astrophysical plasmas. 99% of the visible Universe is in the plasma state. Thus, the understanding of the dynamics of cosmic multi-particle systems under the influence of electromagnetic forces, is of outstanding importance. the generation, reconfiguration, filamentation and energy conversion of magnetic fields in (proto)galaxies, accretion disks, active galactic nuclei. Our analytical and numerical investigations are carried out on the grounds of the (multi)fluid- as well as the kinetic plasma theory. For mor details visit the homepage USM Plasma-Astrophysics. In the Centaurus A x-ray jet high-energy particles are continuously accelerated on kpc length scales up to Lorentz factors of some 107. The aim of the work in our group is a detailed characterization of the young stellar populations in star forming regions and a reconstruction of their star formation histories. A particularly important topic is the investigation of the nteraction between the young stars with the surrounding clouds, especially the strong radiative and wind feedback from newly formed high-mass stars and the resulting processes of cloud dispersal and triggered star formation. For these studies we use observations across a wide range of wavelengths, from the X-ray regime, via the infrared, down to he mm-range. We also perform and analyze observations of individual young stellar objects with the technique of infrared long-baseline interferometry, in order to study the innermost (sub-AU) regions of protoplanetary disks. Infrared interferometric observations of young stars with protoplanetary disks and close binaries. For more details visit the homepage USM Young Stars & Star Formation Group. Color composite of the Chandra X-ray image (blue, green) and MSX 8 micron image (red) of the Carina Nebula, created from the data of the Chandra Carina Complex Project. The research group on Cosmology and Structure Formation is pursuing studies in cosmology and the formation and evolution of large scale structures in the universe. Our work is at the interface of observation and theory, where we seek to bring together new observational constraints with state of the art hydrodynamical simulations of structure formation. We are pursuing cosmological topics such as the nature of the cosmic acceleration and the characteristics of the initial density perturbations. 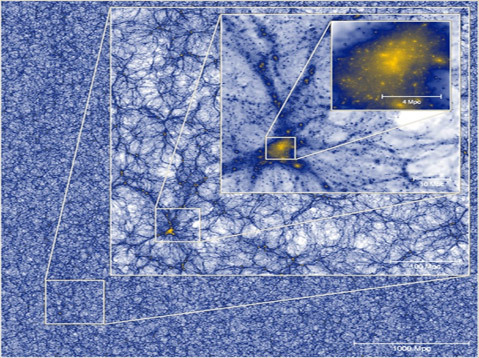 Our ongoing structure formation studies focus on the properties and evolution of the large scale structure, including clusters of galaxies, the most massive collapsed structures in the universe. A primary focus of our group is the science analysis of the Dark Energy Survey (DES), which is a 5000 deg^2, deep multiband optical survey of the southern sky that began in Fall 2012. At USM we are combining these data with South Pole Telescope (SPT) Sunyaev-Zel'dovich effect data and pursuing studies of the evolution of galaxy populations within massive clusters out to redshifts z~1.5, studies of the SZE signatures of clusters and groups within the regions where SPT and DES overlap, and calibrating cluster masses using weak lensing constraints from DES, HST and the VLT. 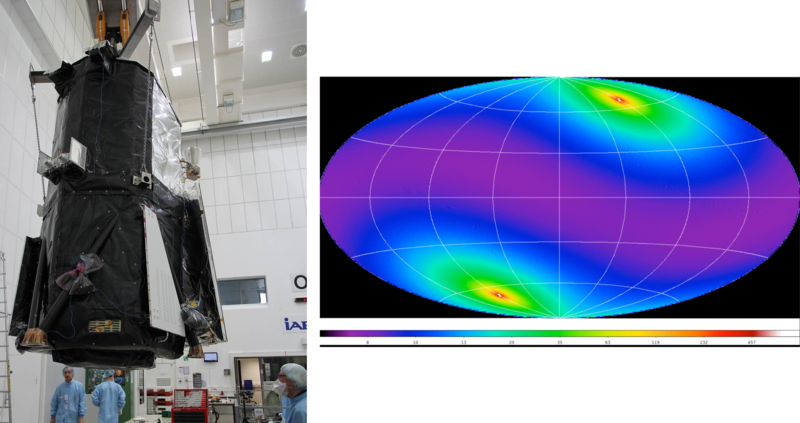 Our science focus will transition somewhat with the launch of the eROSITA X-ray satellite, where we will focus on cluster cosmological studies made possible through the combination of eROSITA data with DES, Pan-STARRs and other data. Development of computational astrophysics algorithms- either in observational or in a numerical context- for application in eROSITA or Euclid. Detecting and characterizing the reionization epoch. The morphology, quantitative characterisation and observational measurement of the large scale structure in the galaxy, dark matter and intergalactic gas distributions. The use of gravitational lensing to characterise the dark matter environments of galaxies and galaxy clusters and statistical properties of the cosmic mass distribution. Development of signal inference and image reconstruction methods based on information theory for galactic and extragalactic observations at various frequency bands ranging from radio to gamma rays. Group members use a mixture of pure theory, high-performance numerical simulations, data interpretation, and direct observations to address these questions. The group is one of the principal nodes of the international Virgo Supercomputing Consortium which has carried out many of the largest cosmological simulations ever completed. It is a Partner in the Sloan Digital Sky Survey IV and PhD projects are availabe to use integral field unit (IFU) spectroscopy of 10,000 nearby galaxies to study stellar populations, kinematics and gas and star-forming properties of galactic bulges, disks and halos. With the MPA High Energy group it is the German centre for the Planck mission which is currently mapping the microwave background radiation. It has built a remote station for the radio interferometer Low Frequency Array. A slice through the dark matter distribution of the Millennium-XXL simulation, focusing on the most massive collapsed structure present a z=0. The Millennium-XXL, the largest simulation of cosmic structure formation ever carried out, follows the gravitational interaction of more than 300 billion dark matter particles on a cubical region of 4200 Mpc across. This calculation is used to study the very large-scale distribution of galaxies and its implications for Dark Energy measurements. The area of interests of the MPA High Energy Astrophysics group can be broadly outlined as physical processes and interaction of matter and radiation under extreme astrophysical conditions. The objects where these processes are investigated include the Universe as a whole, clusters of galaxies, supermassive black holes and jets in AGN, accreting black holes and neutron stars in X-ray binaries, Gamma-ray bursts and the Cosmic Microwave Background. Similarities in the underlying physical processes bind these diverse subjects together. A special focus of the work is accretion onto compact objects (black holes, neutron stars and white dwarfs). This includes theories for the hydrodynamics of the accretion process and the origin of the energetic radiation. Examples are detailed theories for the boundary layer around accreting neutron stars, and the theory of Comptonization and it's applications. In addition members of the group are closely involved with interpretation of the observational signatures of accreting black holes and neutron stars, the study of X-ray emission from the clusters of galaxies, relic radio sources, theories for the central engines of Gamma-ray Bursts, the evolution of binary stars, and the behavior of magnetic fields in a wide range of astrophysical environments. Likewise, this research group has interests in the study of the interaction of CMB photons with matter at different evolutionary epochs of our universe. These include the cosmological recombination, the end of the Dark Ages/beginning of reionization, and the late accelerated expansion phase seeded by a cosmological constant or any sort of Dark Energy. Particular emphasis is paid on the characterization of the CMB spectrum generated during recombination, the interaction of the CMB with the heavy elements synthesized by the first stars, and the secondary anisotropies introduced by newly ionized bubbles, galaxy groups and clusters during the ntermediate and late ages of our universe. The group can host PhD students in any (or a combination of) these areas. One of the key elements of the group's approach is to complement the theoretical advancement of the field with state-of-the-art data analysis of the experimental data. The group is actively using the data from the RXTE, CHANDRA, XMM-Newton, INTEGRAL, Swift and WMAP observatories. The group also provides scientific support for future missions that will lead to substantial progress in high resolution X-ray spectroscopy and microsecond timing. For more details visit the homepage MPA High Energy Astrophysics. Information field theory (IFT) is information theory, the logic of reasoning under uncertainty, applied to fields. A field can be any quantity defined over some space, e.g. the air temperature over Europe, the magnetic field strength in the Milky Way, or the matter density in the Universe. IFT describes how data and knowledge can be used to infer field properties. Mathematically it is a statistical field theory and exploits many of the tools developed for such. Practically, it is a framework for signal processing and image reconstruction. applies IFT to measurement problems in cosmology, high energy astrophysics, and other areas. Research on IFT requires an excellent mathematical training and/or good programming skills. More information can be found at the IFT group page and the IFT resources pages. Examples of IFT applications. Leftmost: An estimator for primordial non-Gaussianity expressed in Feynman diagrams superimpose on an image of the cosmic microwave background (CMB). Middle-left: Reconstructed all-sky Faraday effect, showing the Galactic magnetic field. Middle-right: Reconstructed primordial gravitational potential at the location of the CMB last scattering surface. Rightmost: The gamma-ray sky reconstructed from data of the Fermi satellite in the energy range 0.5-300 GeV. The MPA Supernovae group is a world-leader in modelling the violent deaths of stars in the form of supernovae and studying how such explosions produce the chemical elements, generate gravitational waves or can be used as reliable cosmic distance indicators. Massive stars end their lives in core collapse supernovae when the star has run out of nuclear fuel in the interior. In some cases the explosion following the initial collapse can lead to particularly energetic hypernovae or gamma-ray bursts. Another type of supernovae occurs in binary systems involving white dwarfs, the compact remnants of less massive stars. These thermonuclear supernovae explosion can either be triggered by accretion of material from a companion star or during the merger of two white dwarfs. The MPA group specializes in performing realistic multi-dimensional hydrodynamical supercomputer simulations of the different types of supernovae and gamma-ray bursts, which takes into account detailed microphysics such as turbulent flame propagation, neutrino transfer, magnetic fields and special and general relativistic effects. The supernova models are also used to predict the emergent spectrum to compare with observations. Most of the work within the group is theoretical/computational in nature but more recently the group has lead several observational programs aimed at understanding the physics of supernovae. The group has a long track-record of developing novel and sophisticated numerical methods to enable the extremely computing-intensive hydrodynamical simulations. The group has excellent access to powerful parallel supercomputers and is engaged in two long term Collaborative Research Centers of the German Science Foundation (DFG) on Gravitational Wave Astronomy and on The Dark Universe. It also actively participates in the Excellence cluster on Origin and Structure of the Universe involving MPA, MPE, MPP, ESO, LMU and TUM. Left: A snapshot from a 3D simulation of a core collaps supernova,which demonstrates the complex hydrodynamical velocity field and neutrino heating during the earliest phases of the collapse prior to the final explosion. Right: A simulation of a thermonuclear supernova (SNe type Ia), which shows the 3D structure of the thermonuclear burning front in blue incinerating the white dwarf. The MPA Stellar Astrophysics aims at understanding the physics of stars, providing theoretical stellar models, and using stars as probes of the cosmos, for example for the evolution of galaxies. An important aspect for this work is the study of the origin of the elements -- when, where and how the different chemical elements were produced in the Universe. Essentially all elements have been forged by nuclear reactions in the fiery interiors of stars and MPA has for decades been a world-leader in simulating stellar evolution and nucleosynthesis. Much of the work has focussed on understanding low- and intermediate mass stars and testing the models by means of helio- and asteroseismology. The stellar modelling within the group concentrates on understanding better the physics of stars, since only then nucleosynthesis, the ages of stars, their masses, and in consequence even the evolution of galaxies can only be deciphered with confidence. The focus of our attention lies on improving the treatment of convection in stars of all masses and evolutionary stages, and to provide accurate and reliable models for stars observed by asteroseismology mission. We are actively participating in the analysis and modelling of COROT and KEPLER objects. A small but representative volume of the stellar atmosphere is simulated by computing the convective and radiative energy transport. The 3D geometry of the atmospheric structure and the velocity field and their time-evolution can thereby be calculated and used to predict the emergent stellar spectrum. The research activities at ESO focus on optical, infrared and millimeter wave astronomy using mainly ground-based facilities at ESO observatories in Chile. 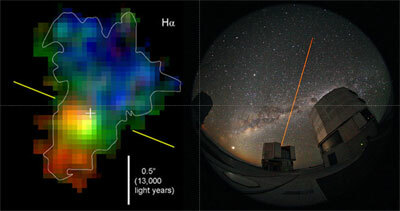 In addition to optical and infrared imaging and spectroscopy ESO astronomers are actively involved in the development and utilization of high-spatial resolution techniques such as adaptive optics or interferometry. Beyond these specific topics, the scientific expertise at ESO in fact covers all major areas of astrophysics, including observational astronomy, modelling and numerical simulations. Research interests of ESO science staff range from the Solar system to the studies of the solar neighbourhood (extrasolar planets, evolved stars, star formation), interstellar medium, Galactic structure, the local universe (Local Group and beyond) and cosmology (galaxy clusters, Gamma-ray bursts, dark matter, lensing). The complete list of PhD topic offered at ESO for all research fields is available at ESO PhD-Topics. More details on science activities at ESO are available at ESO Science. VLT/ISAAC near-infrared image of the Galactic giant HII region NGC 3603 with its central starburst cluster. Stars with masses between 0.1 and 120 solar masses formed simultaneously in the cluster.